For this easy scarf project, you will need approximately 140 grams / 5 ounces of wool or yarn and a pair of size 7 or 8 needles. If you use wool, be sure to keep the label with the washing instructions. When the time comes when you need to wash the scarf, a wool scarf will shrink unless you wash it in cold water with a mild washing product like Zero, and lay it flat to dry. On the other hand, if you knit your scarf from an acrylic polyester blend, the finished garment will be machine washable and drier safe. To cast on knitting stitches, make a slipknot with the yarn on one needle, pass the second needle through the stitch, loop the yarn over the needle and pull it through. 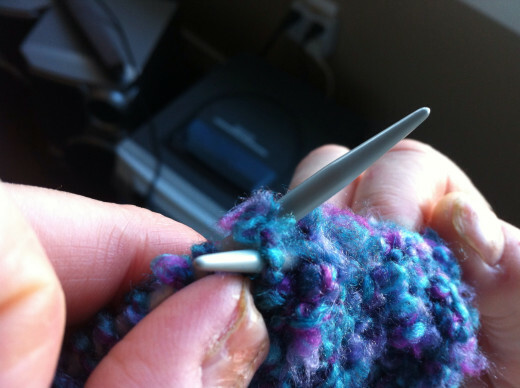 Place the new stitch on the first needle beside the first stitch, and tighten the loop. Repeat, casting each new stitch through the preceding stitch and adding it to the needle, until there are twenty stitches, for a scarf about four inches wide, or twenty eight stitches, for a scarf about six inches wide, on the needle. If you want your scarf to be wider than that, keep casting on in multiples of four for each additional rib. 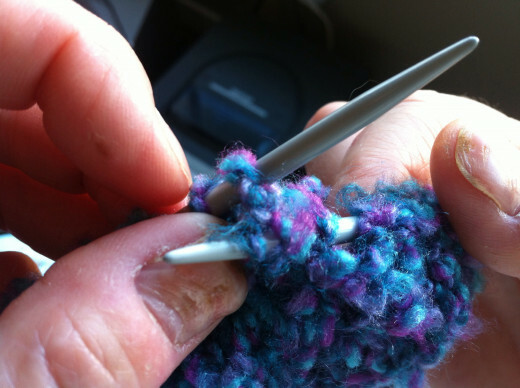 Once you have finished casting on, turn your work and knit the first four stitches. For the knit stitch, put the second needle through the front of the standing stitch, loop the yarn over, and bring the new loop through the standing stitch from the back to make a new stitch on the second needle, then slip the standing stitch off the first needle. Knit the first four stitches. 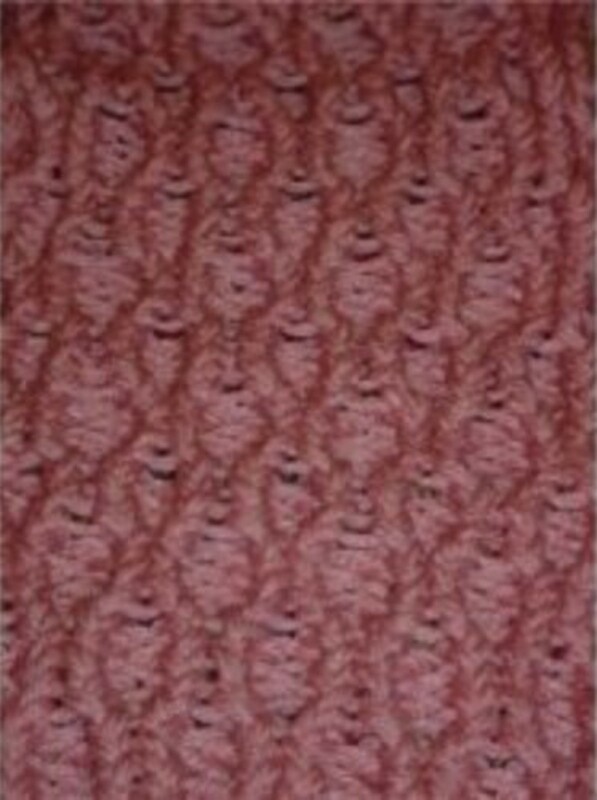 Easy to follow instructions for many knitting patterns and beginner projects. 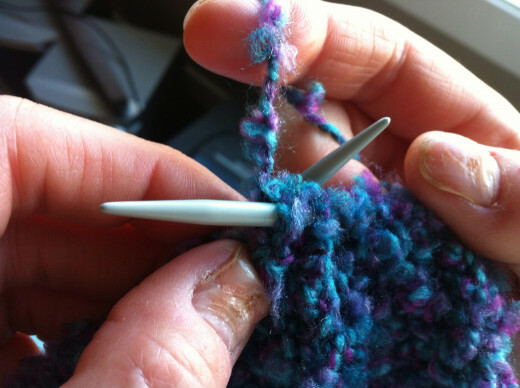 To purl knit, bring the yarn between the needles to the front of the work. put the second needle through the back of the standing stitch, loop the yarn under the needle, behind and over, bring the new loop through the standing stitch, and slip the standing stitch off the first needle. Purl the second four stitches. 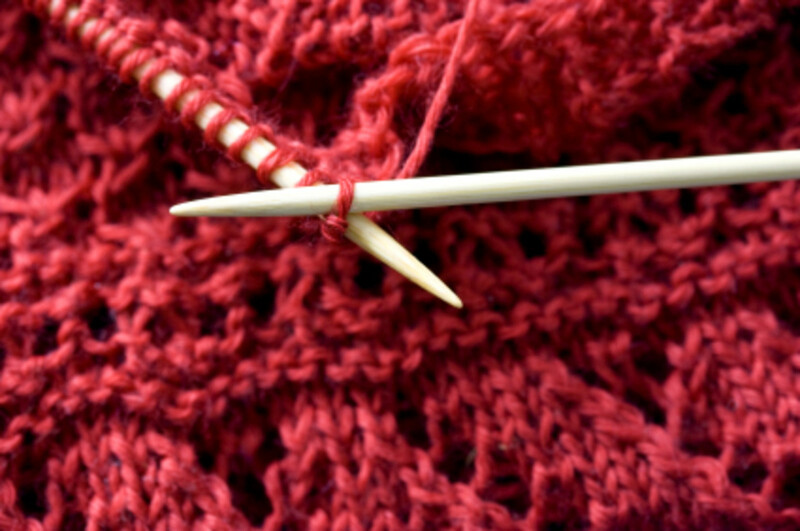 Continue in this pattern, knit four, purl four, until the end of the row. When you begin the next row, the purl side will be facing you, so start the next row purl four, knit four, purl four, knit four. It will help you to knit faster and to keep even tension as you go if you can learn to thread the working yarn through your fingers as you see in the video. 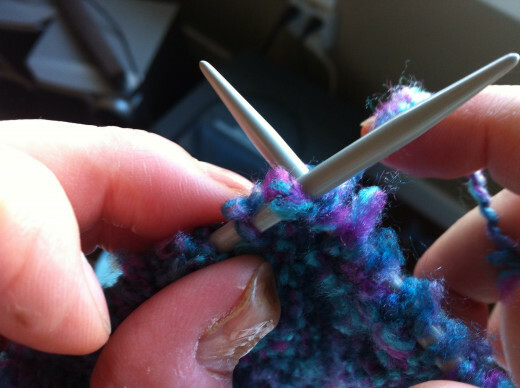 Keep the yarn across the fingernail near the tip of the index finger, thread it under the third and fourth fingers, and catch it lightly between the baby and fourth fingers. 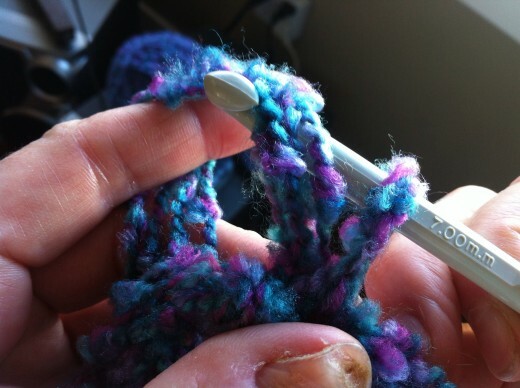 When you loop the thread, use the index finger to place the yarn over the needle without having to drop your work. 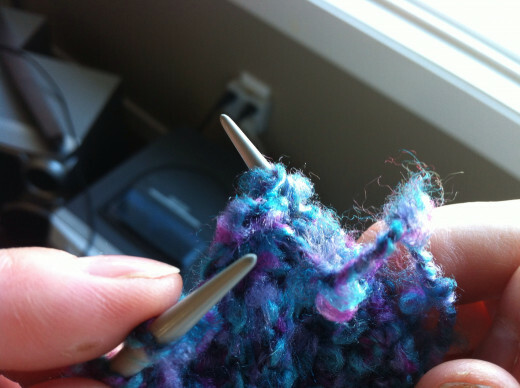 Adjust the tension of the new stitch by pulling gently with the baby and fourth fingers to tighten the loop. This will get easier as you practice, and will end up making your knitting project move much quicker and with more even tension in the finished garment. The rib stitch is one of the basic knitting stitches, and can be varied depending how wide you make the ribs. Knit one, purl one for narrow ribs, or for the cuffs of mittens or hats; knit six, purl six for very wide ribs on a larger garment like a poncho or sweater. Once your scarf is as long as you want it, casting off is easy. In the scarf shown, the finished length was about five feet, using most of the 5 ounce ball of Bernat Soft Boucle acrylic/polyester blend yarn. Be sure to leave enough yarn left for the fringes. 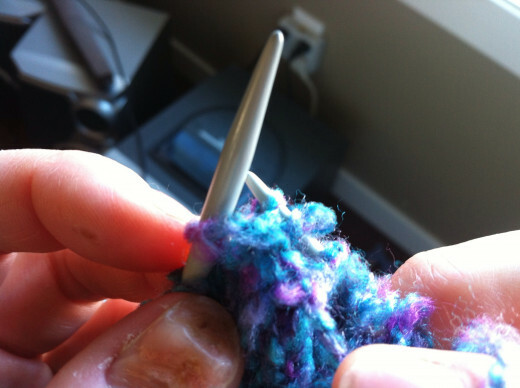 To cast off, knit two stitches as usual, then bring the first stitch over the second one, and slide it off the needle. There is now one stitch left on the needle. Knit another stitch, and bring the back stitch over the front one and slide it off the needle, leaving one stitch left on the needle. 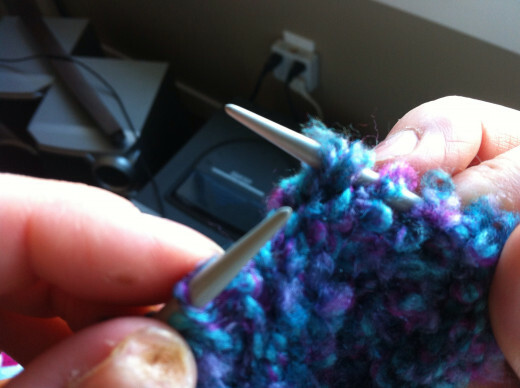 Continue casting off in this way until there is only one stitch left. Cut the yarn, and bring the end through the last stitch and tighten it. You can leave the thread hanging to blend in with the fringe, or use a crochet hook to work the last end through the stitches of the scarf so it is not visible. Give your scarf a finished look by adding a fringe. 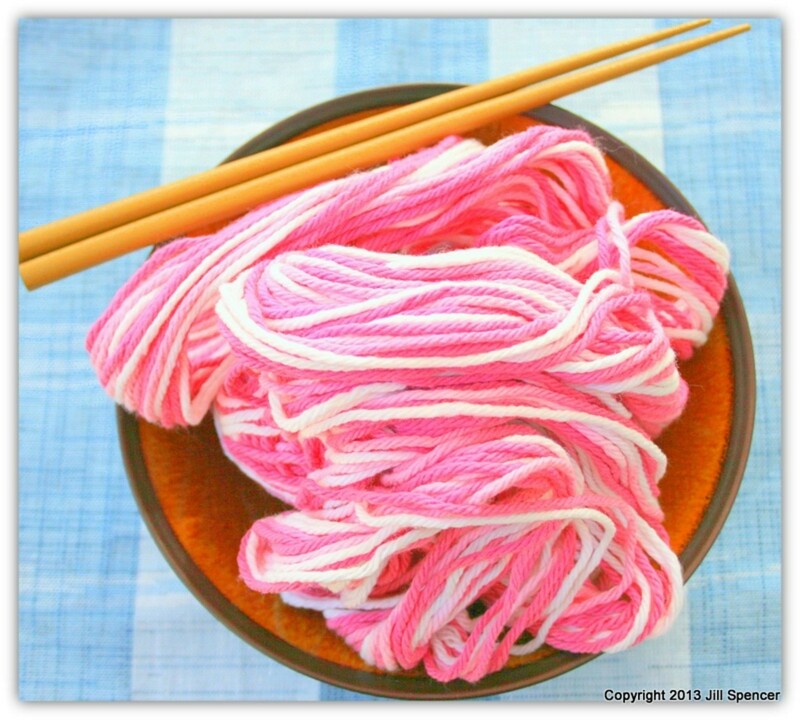 To make many fringe threads evenly at one time, wrap yarn around a book forty times, then cut the yarn. This will give you twenty pairs of fringes the same length, enough for one fringe in each rib in a five-ribbed scarf. If you need more, make them. 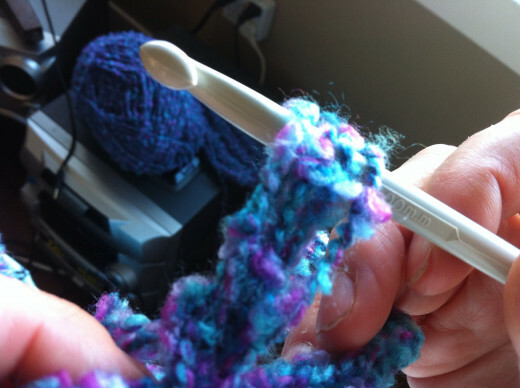 With your fingers, find a gap between stitches in the centre of the first rib, then put the crochet hook through. Fold the first pair of fringe threads in half, catch the fold with the crochet hook, and bring the loop through to the front. 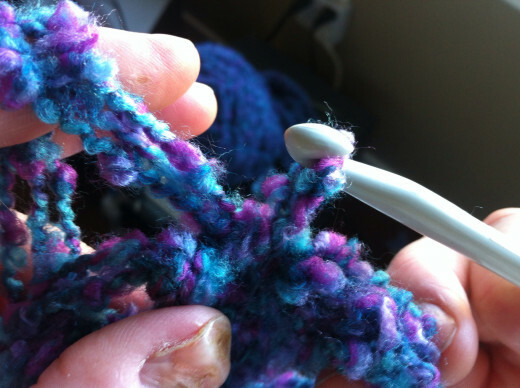 Drop the crochet hook, bring the fringe ends through the loop, and tighten the loop. Space additional fringes evenly along the edge of the scarf, one in each rib, and perhaps one between each rib too. Then complete the fringe at the other end of the scarf. Your scarf is finished! You can wear it a feel proud of yourself, or give it away and start another one in another pattern. Experiment with wider or narrower ribs, or try a garter stitch pattern by knitting every row. 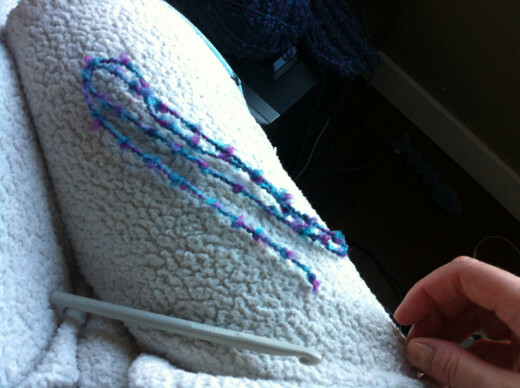 For a stocking stitch pattern, knit one row, then purl the next. 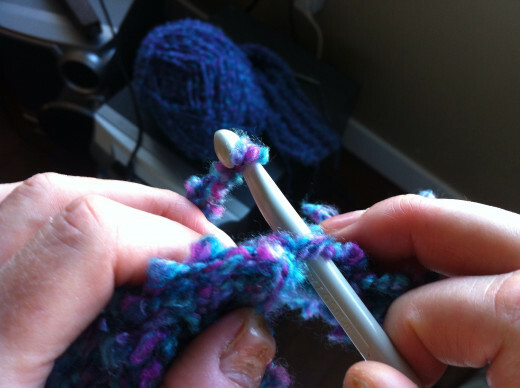 How To Cast On For Knitting - Three Ways! 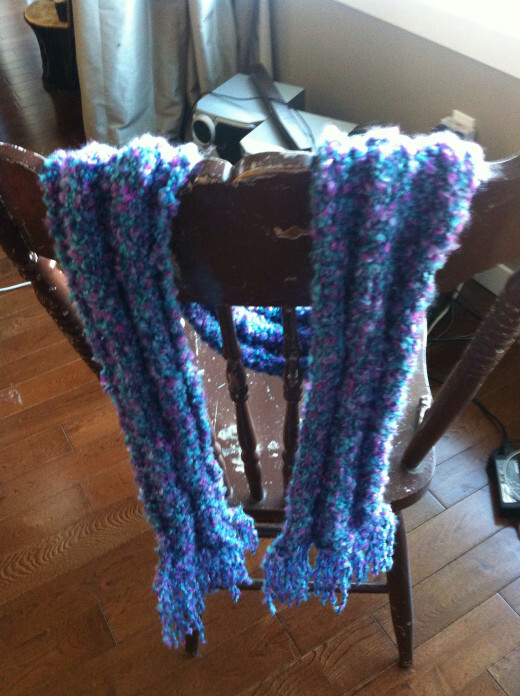 The yarn was inexpensive acrylic blend from Walmart, only a couple of dollars a ball and one ball did the scarf. I love it--soft, warm and colourful. Thanks for your comment! I just finished a cowl that wraps twice around my neck. I cast on 40 stitches and knitted it to the length of 52". 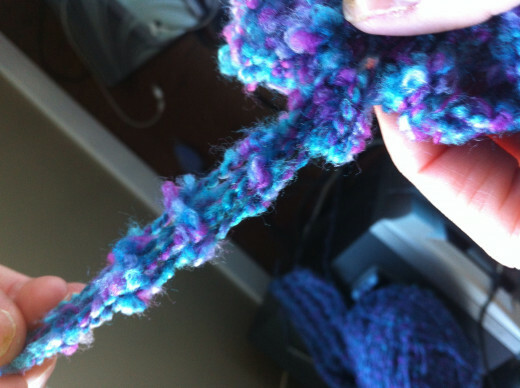 I then joined the two ends and made an "infinity" type of scarf that twist and wrap around my neck. (I will be writing an article about this project soon. Not sure where it will be published at this time). 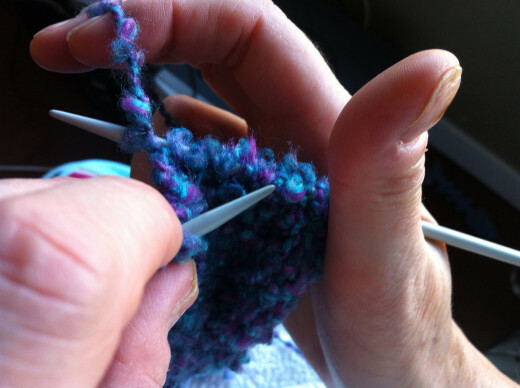 "Continental" knitting is when one holds the yarn coming from the ball in the left hand. 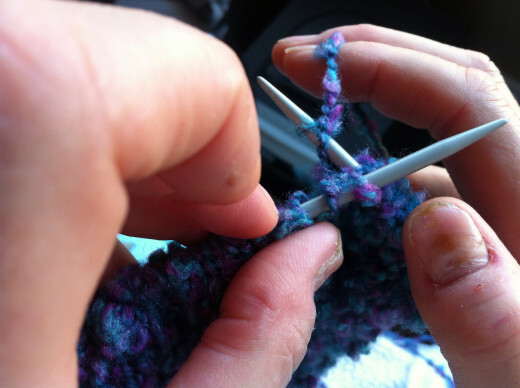 Most of my friends hold the yarn to be knitted into a project with the right hand. I am trying to learn to hold the yarn with the right hand at present. 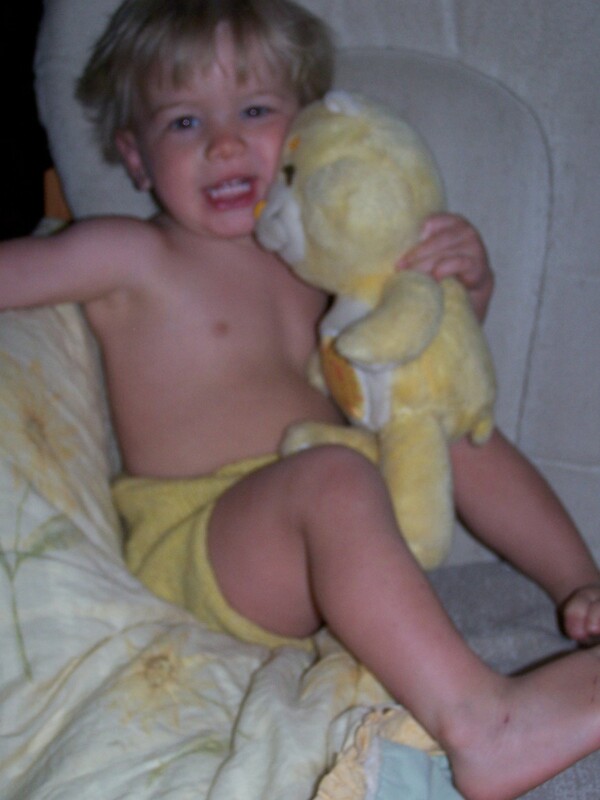 I am finding that this change is slowing down my speed. What are you working on now, LittleRedWagon? and what is "continental" knitting? I began knitting a little over a year ago and now I am addicted. Thank you for the interesting photos. 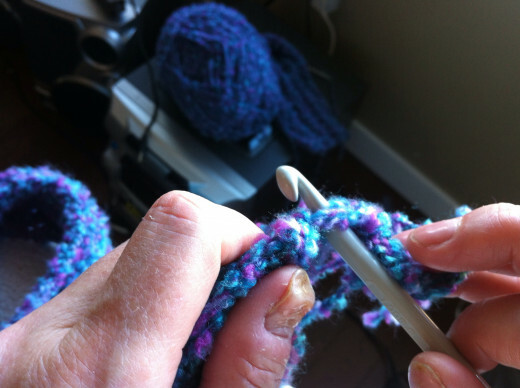 I knit differently than you do (I was told that I am a "continental" knitter) and I find it interesting to watch how other people go about knitting. Thanks for commenting, Chrissie! I go in spurts with knitting, sometimes doing a project and then leaving it for years. When I wasn't so busy I knit more complex projects like sweaters, but now I like something I know I can finish in a weekend or two. The pics and video are VERY helpful. I knitted a scarf a few years ago but never quite got addicted to knitting. Great hub! I am so happy you took the time to comment, photographybyar! I hope you have time to try the scarf project. You can finish it in a couple of weekends. Have fun!